Here is all the information you need for OFF FRINGE 2019 applications! Join Montreal chef Nantha Kumar at a one of a kind dinner to raise funds for the Festival St-Ambroise Fringe de Montréal. MainLine Theatre is proud to partner with Nantha’s Kitchen and Centrale culinaire to bring you this one-night-only event. Click here to for more info or to reserve your place at the table! THIS HOLIDAY SEASON, GIVE THE GIFT OF FRINGE! For a limited time only, buy festival passes at 2018 prices, and enjoy specials on our merch! Passes will be going up ever so slightly in summer 2019 so get yours now and save, while supplies last! You can also offer the gift of FRINGE in the form of gift certificates! Visit our Holiday Sale page to take advantage of these deals. Your special holiday pass and merchandise can be picked up at MainLine Theatre (3997 St-Laurent) before December 20 or select a shipping option at checkout. Sales taxes are included in the purchase price. 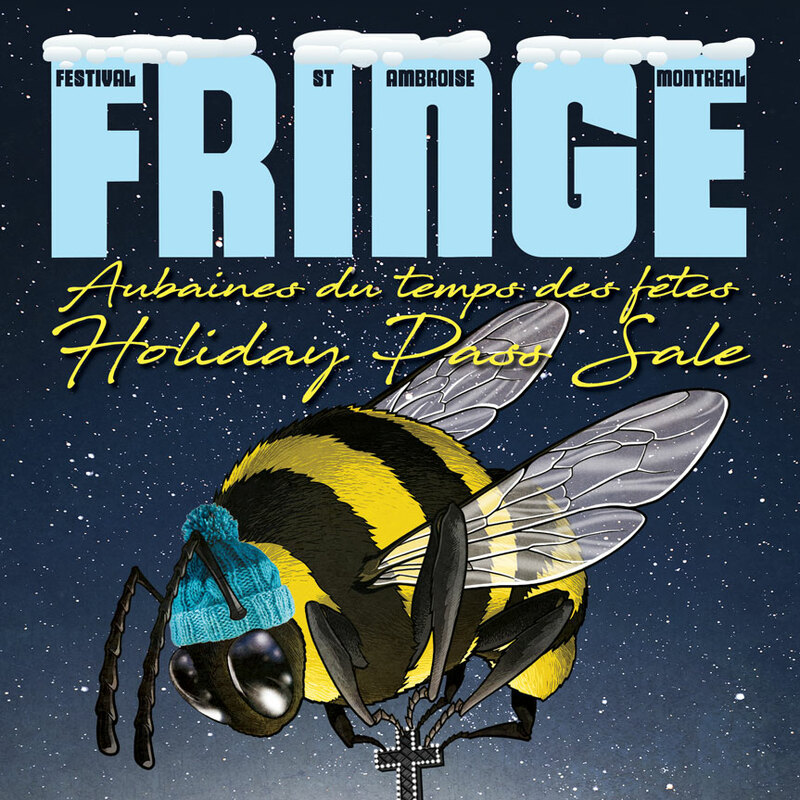 https://montrealfringe.ca/wp-content/uploads/header-trans1920-1030x278.png 0 0 Geoff Agombar https://montrealfringe.ca/wp-content/uploads/header-trans1920-1030x278.png Geoff Agombar2018-12-08 17:59:162018-12-19 14:54:31Holiday Sale! We are pleased to announce the following companies have been accepted into the 2019 edition of the St-Ambroise Montreal FRINGE Festival! Remember, you have until 6PM on Friday, November 16 to apply. Head on over to this page for full information: A-Z Applications. Stay tuned for our lottery party details! https://montrealfringe.ca/wp-content/uploads/header-trans1920-1030x278.png 0 0 Geoff Agombar https://montrealfringe.ca/wp-content/uploads/header-trans1920-1030x278.png Geoff Agombar2018-10-09 14:50:512018-10-09 14:50:51Early Bird Winners! Join us October 3-7 for the second edition of Encore for a multitude of incredible shows that blew us away during the FRINGE! Don’t miss your chance to see, or see again, Dance Side of the Moon by Helen Simard, 4’33” in Baghdad by Thought Experiment Productions, Mme Brulé by Évelyne Laniel and Don’t Read the Comments by Sermo Scomber Theatre. Get your tickets or you will regret not seeing the talent they have to offer. FRINGE on! https://montrealfringe.ca/wp-content/uploads/header-trans1920-1030x278.png 0 0 Geoff Agombar https://montrealfringe.ca/wp-content/uploads/header-trans1920-1030x278.png Geoff Agombar2018-10-02 16:25:282018-10-02 16:25:28ENCORE! ENCORE! ENCORE! Due to an unprecedented amount of traffic on our website, our site is timing everyone out including us. Therefore, we are going to postpone the Early Bird application time until 6PM EST to give us time to upgrade our server bandwidth and put in place a new, fair way to make the form live simultaneously for everyone at exactly the same time that everyone is mashing the refresh button! We apologize for the inconvenience, and we’re overwhelmed by your excitement. Good luck everyone! Nous avons un nombre super élevé de personnes sur notre site en ce moment — autant de monde que notre site s’est planté ! Nous allons donc décaler l’heure du spécial lève tôt à 18 h ce soir. Ceci nous donnera le temps d’augmenter la vitesse de notre serveur et d’adopter une nouvelle procédure pour activer les formulaires au même moment pour tout le monde, et ce exactement au moment de trafic le plus élevé. Nous sommes tellement ravis de ce niveau d’intérêt record, et nous nous excusons pour cette inconvenience. Bonne chance à vous tous ! 1) We choose artists by lottery or first-come first-accepted. 2) You are uncensored + free to present whatever you want. 3) You keep 100% of the ticketed price of your show. 4) Tickets are $12 or less, making them affordable for patrons. THEATRE, DANCE, POETRY, PERFORMANCE ART, PUPPETRY, IMPROV, MIME, MAGIC, COMEDY, CABARET, CIRCUS, SKETCH, DRAG, SHAKESPEARE, CLOWNING, PHYSICAL THEATRE, STAND UP, SPOKEN WORD, MUSICAL THEATRE, BURLESQUE, DRAMA, OPERA, ROCK OPERA, OPERETTA, ROCKERETTA, STORYTELLING, CONTORTION, WORK-SHOPPING, TRUE STORIES, NEW WORK, OLD WORK, BILINGUAL WORK, MUSIC & MORE! *EARLY BIRDS: We will accept the first 8 completed applications in each local quota and the first 5 in the Canadian and international quotas that come in through our online form with payment of the Administration Fee. If successful, you will be expected the full Application Fee within 24 hours to be accepted. If you are not among the first 8 or 5 applications, your application will carry over automatically to the November lottery. The St-Ambroise Montreal FRINGE Festival is an international multidisciplinary arts party celebrating creativity without limits that includes theatre, music, comedy, dance, spoken word and more from over 500 performers. FRANKIE Award Winners of the 2018 St-Ambroise Montreal FRINGE Festival! June 18, Montreal – The 28th edition of the St-Ambroise Montreal FRINGE Festival came to a close Sunday evening at the historic Club Soda with the festival’s prestigious Frankie Awards and closing night party. Fourteen awards were handed out to FRINGE artists by festival partners. The Frankie Awards are named after Frank Hopkins, a key benefactor during the festival’s early years of the festival. Frank Hopkins passed away on November 11, 2015, his 93rd birthday. As Frank always did, the awards in his name shine a light of the stand-out productions of each edition. The 2018 FRANKIE Awards are listed by award title and sponsor followed by the winner and the other nominees. https://montrealfringe.ca/wp-content/uploads/header-trans1920-1030x278.png 0 0 Sarah Grenier-Laforce https://montrealfringe.ca/wp-content/uploads/header-trans1920-1030x278.png Sarah Grenier-Laforce2018-06-20 17:28:042018-06-20 17:28:04FRANKIE Award Winners of the 2018 St-Ambroise Montreal FRINGE Festival! FRANKIE Award Nominations for the 28th St-Ambroise Montreal FRINGE Festival! June 14, Montreal – The St-Ambroise Montreal FRINGE Festival will be closing with a bang on June 17 with the annual FRANKIE Award Ceremony taking place at the stunning Club Soda (1225 St Laurent Boulevard) starting at 11pm. Participating juries and festival staff are pleased to announce the nominated shows and performance companies. This year there will be 11 prizes awarded, covering an array of values. The Frankie Awards are named after Frank Hopkins, a key benefactor during the early years of the festival. Frank Hopkins passed away on November 11, 2015, his 93rd birthday. As Frank always did, the awards in his name shine a light of the stand-out productions of each edition. https://montrealfringe.ca/wp-content/uploads/header-trans1920-1030x278.png 0 0 Guillaume Doussin https://montrealfringe.ca/wp-content/uploads/header-trans1920-1030x278.png Guillaume Doussin2018-06-14 14:44:082018-06-14 17:38:28FRANKIE Award Nominations for the 28th St-Ambroise Montreal FRINGE Festival!